It's easy to look forward to lunchtime when you pack a brown bag lunch with one of these delicious, easy recipes. From soups and salads to sandwiches and veggie bowls, we've collected our favorite, yummy, nutritious brown bag lunch ideas that you can take to work, or send to school with the kids, to keep your energy going all through the day. Here's a quick and easy chicken noodle soup recipe that's hearty enough to fill up your tummy at lunchtime and keep you going all afternoon, when you bring it to work for a brown bag lunch. Condensed soups and some real cream added to the mix, make this soup rich and velvety in texture, while adding fabulous flavor. There are also fresh chopped vegetables, frozen veggies and some lovely fresh herbs to add nutrition and color. Makes a great lunch bag soup for kids to bring to school, too! On cooler days, you'll be super glad you packed a thermos of this thick and hearty vegetarian barley vegetable soup recipe for your brown bag lunch. Pearl barley is a nutritious cereal grain that is naturally high in protein, fiber, folate, and other healthy vitamins and minerals, making it a great grain to get to know and use in your every day recipes. 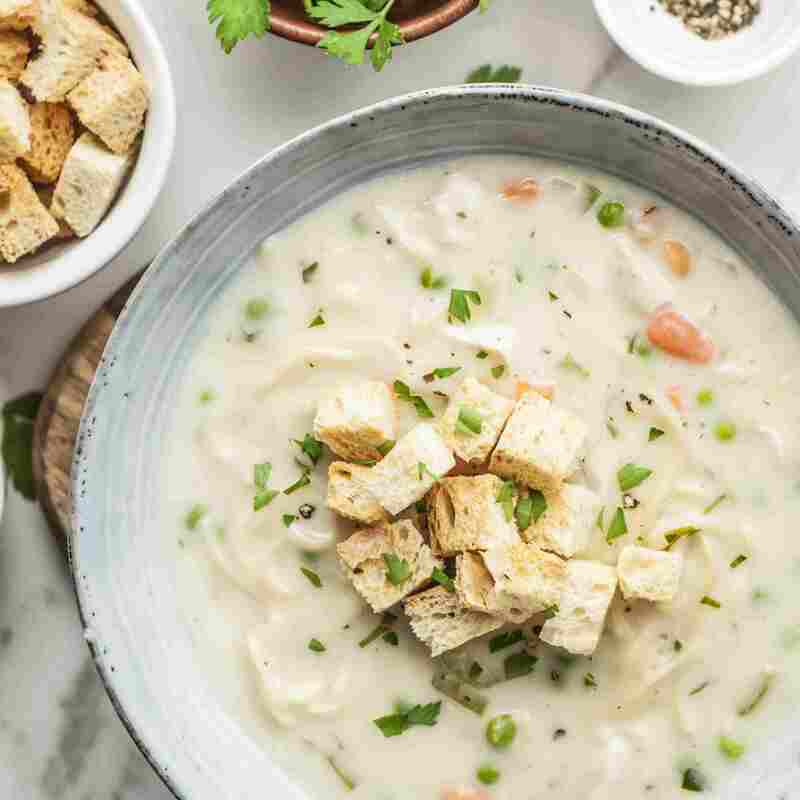 It's so easy to cook this nutritious soup for lunch using a slow cooker, and it's absolutely packed full of good-for-you nutrients and fiber, with pearl barley, tons of veggies, and sweet potatoes. The caprese sandwich is a classic Italian vegetarian sub that is packed full of awesome flavors, while also being super easy to make. 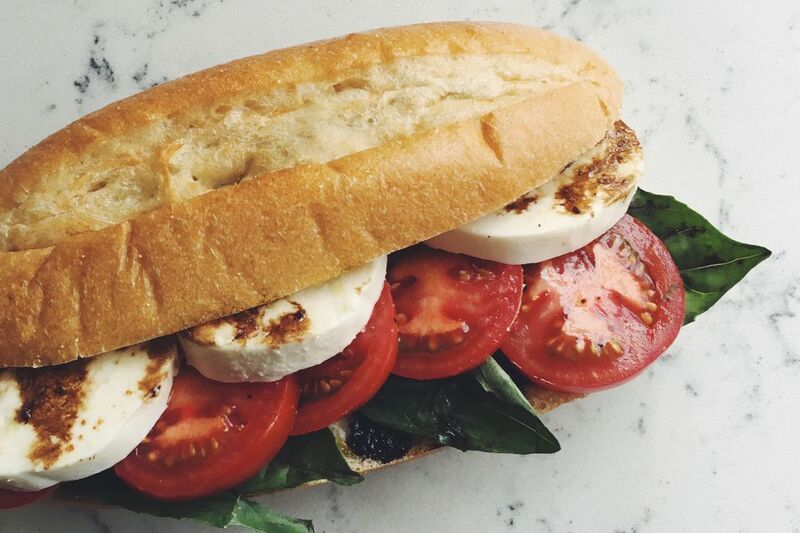 Made with thick slices of fresh, creamy tasting mozzarella cheese, sweet and hearty Italian tomatoes, rich extra virgin olive oil, tangy balsamic glaze, and herbaceous, fresh green basil, it's sure to become a lunch bag favorite in your family. No wonder this sandwich has gone from being an Italian classic, to an American favorite! Treat yourself or the kids to a restaurant-style Middle Eastern vegetarian pita sandwich for lunch. This yummy, filling sandwich is stuffed with simple homemade tzatziki, tabbouleh, feta cheese, fresh vegetables and plenty of fresh herbs for great flavor. If you prefer your sandwiches with a little bit of kick, you can always sneak in a little bit of harissa, a favorite North African hot chili paste made from a blend of roasted, spicy red peppers. The roasted veggie dish is loaded with taste, color and goodness, making it a great brown bag lunch for vegetarians who want to enjoy something warming at mid-day. You could eat it cold, but zapping the ingredients in the microwave quickly to warm it up will bring out the flavors of the ingredients, and the delicious aroma will definitely cause your co-workers to look at your lunch with envy. Earthy vegetables and white beans are roasted with fresh thyme, then tossed with nutritious shredded kale, white beans, and kimchi on a base of white rice. A tangy soy and lemon sauce ties it all together. Quinoa is the seed of an edible grain, that's become one of the world's most popular health foods. Naturally gluten-free, high in protein, and one of the few plant foods that contain all nine essential amino acids, quinoa is known as a super-food for its many beneficial vitamins, nutrients, and antioxidants.This tasty quinoa, tuna, and chickpea salad recipe is a lunchtime favorite. Fluffy quinoa is tossed with protein-rich canned tuna and chickpeas, tender baby spinach leaves, fresh cilantro, wake-you-up mint, crunchy celery, mild spring onions, and sweet baby tomatoes, all tossed in a light and tasty dressing. Makes a satisfying meal at lunch, that will keep adults and kids alike going strong all afternoon. Raisin bread adds something extra special, and a little bit of surprising sweetness, to this classic Waldorf salad sandwich recipe. It's the perfect sandwich for your next brown bag lunch, or to send to school with the kids, to keep tummies full until it's time to come home for the day. Waldorf salad sandwich filling is made with chopped sweet apples, crunchy celery, and walnuts, in a creamy mayonnaise dressing. To avoid a soggy sammie situation, pack the salad and sandwich bread separately and assemble right before eating at lunchtime. Yum! Wrap sandwiches are a brown bag lunch favorite, and these these delicious BLT wrap sandwiches are perfect for taking to school or work in your lunch bag. It's a great way to sneak the irresistible taste of bacon into your day at lunch! Keep all of the ingredients for this sandwich wrap on hand and you can make it in just a few minutes. Not much effort, considering how well this crunchy, yummy sandwich delivers on taste! Your co-workers will beg for a bite of this unusual looking, delicious, healthy, turkey sandwich. Beet hummus brings a vibrant pink shade and plenty of awesome nutrients and fiber to this yummy lunch sandwich recipe. Turkey and chickpeas add protein, to keep your energy going all afternoon, while tomatoes, feta cheese, and the baby kale add calcium and essential vitamins. Looking for a satisfying vegetarian meal that you can bring to work in your brown bag lunch? Look no further than this wholesome quinoa bowl that's full of plenty of big Mediterranean flavors. Roasted red pepper-almond dip, cucumbers, feta cheese, Kalamata olives, red onion, pepperoncini, avocado, and parsley add pizzazz to healthy quinoa grains. The result is the perfect mix of crisp and creamy textures, plus fresh and warming flavors. Here's a well-seasoned chicken salad that is sure to make its way into your family's brown bag lunches, once you try it just one time. It starts with store-bought rotisserie chicken, for a super easy preparation. It's wonderful enjoyed on its own, in pita pockets, or on a bed of iceberg lettuce or mixed salad greens.